There are echoes of Bernardo Bertolucci’s The Conformist in Marshland, the latest crime thriller from Spanish director, and co-writer (with Rafael Cobos), Alberto Rodríguez. Not in the narrative, the cinematography or the locations, but in the political setting. Both films take place during periods of monumental political upheaval (post-Mussolini Italy, in the case of the former, and post-Franco Spain, in the latter) and both filmmakers ensure these unstable social environments are deeply seeded within their pictures. The film follows Juan and Pedro, two out-of-town detectives called to the Spanish south coast wetlands to investigate the disappearance of two teenage sisters. Their search leads them further and further into the snare of the titular marshland, as they begin to discover just how wide this web is spun. There’s a suffocating sense of ambivalence and uncertainty to every frame of Marshland. The politics weigh heavily on the characters’ every action and the sense of burden for these central players is palpable. In the same breath, they denounce the previous era’s fascist dictatorship whilst also finding themselves resorting to off-the-book policing methods. It’s a fascinating contradiction and one made even more powerful by the two character’s seeming blindness to it. The significance of the locale is not to be underestimated and our two detectives journey from down-and-out rural villages to dust-ridden dilapidated farmhouses and then onto the boggy marsh. And just to make the whole thing that tad more oppressive, the heavens have a tendency to open with a biblical fury whenever they start to make progress. Pathetic fallacy (in this case, the weather reflecting the characters’ situations and emotions) can come across as a bit GCSE English Literature, but here it’s seen to be ferocious and deeply troubling. This brilliant combination of striking locations and symbolic weather patterns is elevated by Alex Catalán’s intense cinematography. You’ll feel the heat as he scorches his frame to match the torrid Mediterranean sun, which Rodríguez will suddenly interrupt with vast bird’s-eye view shots of the surrounding land. Created by digitising the photographs of Hector Garrido, these shots are used sparingly, and have the power to take your breath away at every appearance. In fact, the film opens with a montage of such shots, tracking across the beaten marshes. The striking brain-like undulations seem totally alien and stand jarringly at odds with the fiercely realist approach taken elsewhere. The characters we were previously so close to, both physically and emotionally – we remain in their company for the entirety of the running time, thus finding ourselves just as lost as they are – are abruptly reduced to mere pinpricks on an endless canvas. The enormity of their task is confirmed. 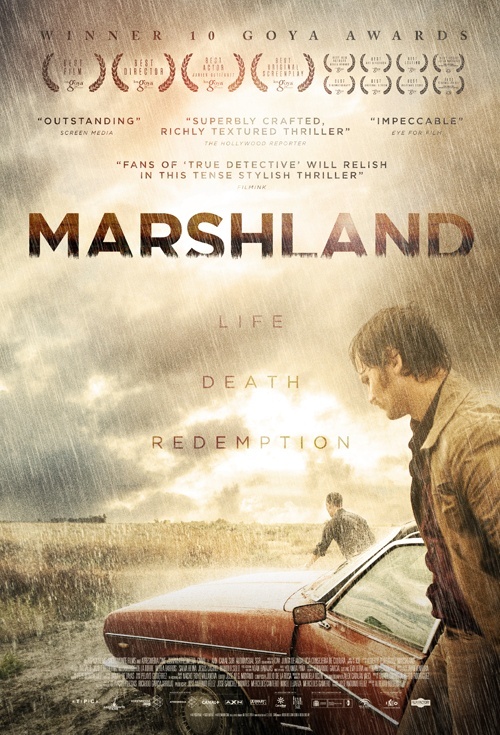 Marshland is a really terrific piece of world cinema. The film’s demanding political foundations make for challenging viewing for those out of the know (myself very much included; even a second watch left me wrestling with the social intricacies), but the rewards are numerable and deeply unsettling.